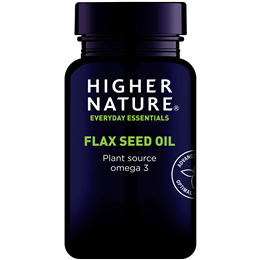 Flax Seed Oil is rich in the plant source Omega 3 essential fatty acid, alpha-linolenic acid. It also provides the omega 6 essential fatty acid linoleic acid and oleic acid, the Omega 9 monounsaturated fatty acid. Alpha-linolenic acid converts to EPA and DHA, important for healthy heart, arteries, brain and flexible joints. Linoleic acid converts to gamma-linolenic acid (GLA), important for healthy hormone balance, skin, circulation, nerve function and immunity. Oleic acid supports cardiovascular health and may be necessary for healthy immune system functioning. 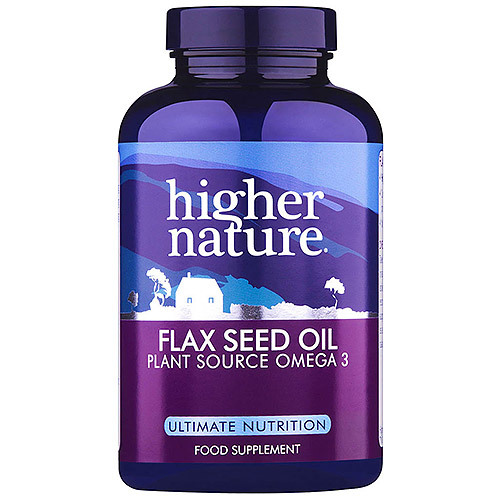 Omega Excellence Flax Seed Oil provides all the benefits of Flax Seed Oil in a convenient, carob-coated capsule to protect the oil from light. This cold-pressed Flax seed oil is ideal for use when travelling. Low carbon footprint: produced in Europe. CONTAINS NO added sugar, salt, starch, soya, yeast, wheat, gluten, maize/corn, lactose, dairy products, artificial preservatives, colours or flavourings. Cold pressed, unrefined flax (linum usitatissimum) seed oil, capsule: gelatine, glycerine. Take 1 - 3 capsules, 3 times daily or as a healthcare professional advises. Below are reviews of Omega Excellence Flax Seed Oil - 60 x 1000mg Caps by bodykind customers. If you have tried this product we'd love to hear what you think so please leave a review.